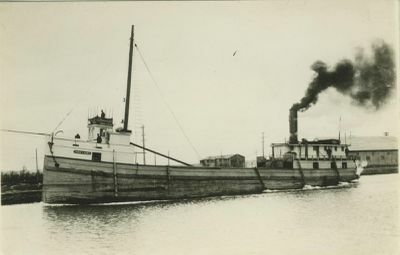 1922, Nov 25 Wreck removed from St. Clair River, taken to Pine River & broken up. 1871, Sep 6 Enrolled Port Huron; ran Saginaw to Cleveland. 1872, Mar 14 Owned Charles Mears, Lincoln, MI & William Anderson, Chicago; ran Lincoln to Chicago. 1873, Mar 11 Owned H.R. Greene & John Ebbert, Chicago. 1875, Oct Disabled; taken to Manitowoc for repairs. 1878, Aug 15 Owned Simeon Cobb, Chicago. 1879, Apr 4 Readmeasured 248.71 gross tons. 1880, Jun 11 Owned Simeon Cobb, Chicago & Henry Simonds, Boston; 248.71 gross/175.43 net tons; ran Chicago to Muskegon. 1885, May Collided with steamer CITY OF MILWAUKEE at Chicago. 1887 Apr 11 Readmeasured 244.23 gross/189.13 net tons; same owners. c1887-88 Rebuilt and re-engined; given HPNC engine 20 x 24"; 285 hp @ 110 rpm; built Cowie Engine Works; Johnston Bros; firebox boiler 6 1/2 x 12.
c1892 Given firebox boiler 9 x 15 built M. Riter, Buffalo, NY 1892. 1893, Feb 28 Owned Simeon Cobb, Chicago. 1895, Jul 10 Owned O.S. Richardson, Chicago "coal dealer". 1896, Oct 18 Owned Cartier Lumber Co., Ludington, MI. 1897, Mar 1 Enrolled Sandusky; owned Mrs. Carrie McGlone Koch, Sandusky. 1912, Apr 18 Owned Jerry Shamplain (Shampaign), Sandusky. 1913, Jun 16 Owned Jerry Shampaign & Mae Lockhart, Sandusky. c1915 Engine changed to F & AC - 17, 39 x 21"; built Detroit Shipbuilding Co., 1915. 1916, Apr 3 Owned Mae Lockhart, Detroit & Jerry Shampaign, Sandusky. 1918, Dec 18 Owned Mae Lockhart, Detroit. 1920 New scotch boiler 10 x 11 1/2; Kingsford Boiler Works, Oswego. 1922, Aug 10 Vessel burned St. Clair River above St. Clair Flats Canal; 11 people on board; no lives lost. 1922, Sep 15 Documents surrendered Detroit.